Luxury mattress made from an advanced foam. Thanks to the essential oils of orange blossom Neroli foam helps to calm the sleep. Due to its extreme bulk density it has an excellent lifetime. Functionally, The Visco foam Thermosilver is a guarantee of excellent orthopedic, thermoregulatory and antibacterial properties. The cover Silktouch stitched with a lazy foam creates a unique feeling of luxury which is evident in the first contact with the mattress. SILKTOUCH stitched with viscoelastic - lazy foam and PES fiber 100 g / m², GOLDTOUCH fabric sewn at the side. SILKTOUCH upholstery stitched with PES fiber 300 g / m². 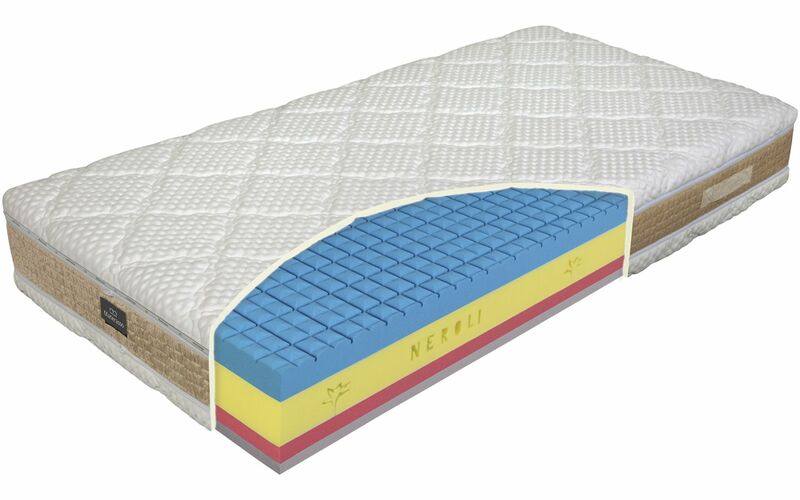 Top plate: NEROLI® flavored HR foam with a density of 60 kg / m³; yellow foam: cold HR foam; red foam: antibacterial foam SANITIZED; Bottom plate: THERMOSILVER foam.